For this quirky Los Angeles couple they wanted to be photographed in Venice, California which was a special treat for me. Although I will often photograph engagement sessions in Venice, I'm not often asked to work there as a wedding photographer. This couple was photographed under a mural created by artist Rip Cronk. This particular mural is titled "Venice Beach Chorus Line" and it is intended to highlyght multiethnic camaraderie and homogeneity. The mural is inspired by Cubist and Futurist elements in a way that captures some of the flavor of the Venice Boardwalk. For more information about Rip Cronk, check out his website. 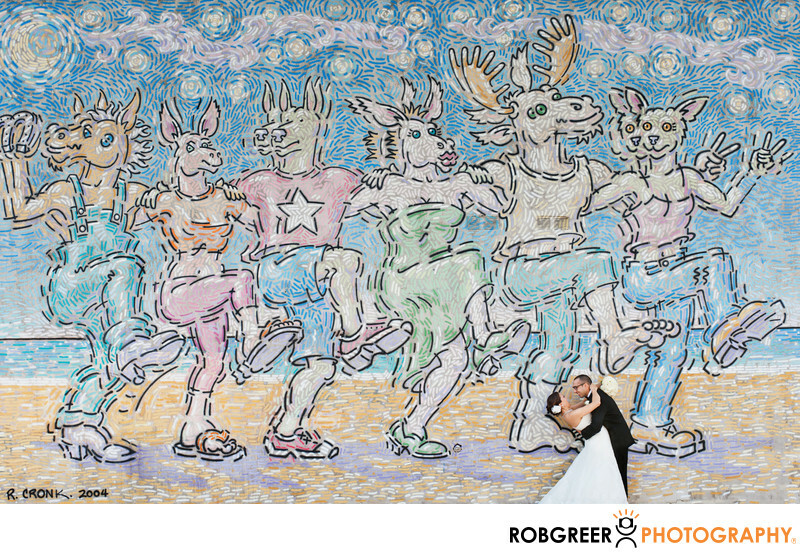 I was careful to position the bridegroom in between the legs and under the foot of the antlered moose so as to help differentiate them from the busy background. One thing I love about this photograph is that eventually this mural will likely disappear and then this photograph will become historical in context in that it will show an interesting piece of Venice Beach history. Venice Beach Boardwalk is located in Venice, California. Phone: (310) 399-2775. Website: http://venicebeach.com/. Location: 1800 Ocean Front Walk, Venice, CA 90291. 1/160; f/9.0; ISO 400; 32.0 mm.